The EPIA M10000 is not only a speed upgrade to the M9000, but a new CPU core as well. This board is a nice improvement over the M9000. Read the review to see more. Only once in awhile I get excited over something not based on speed, and the first time was when I heard about the Mini-ITX. 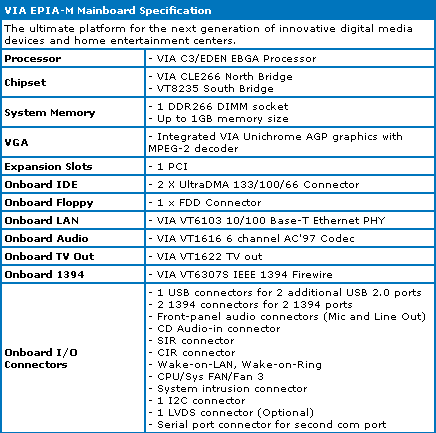 After the initial hoopla wore off, team VIA introduced the M series of boards that promised to deliver on what the board was really meant to do; Serve your digital content. I have already seen the M9000, now with an updated CPU, VIA hopes to deliver another big thing in a small package. The old M9000 still used the Ezra core of the C3 CPU. The Nehemiah is the next step in the C3 technology. The Nehemiah is built for speeds greater than 1 Ghz (this one does run at 1 Ghz). There are a multitude of new features on the Nehemiah that the Ezra lacked. First off, the Nehemiah has a full speed Floating Point Unit (FPU), this generally increases the speed of the entire CPU because most modern day programs rely on the FPU to do math calculations. The old Ezra FPU ran at half the core speed, which really hurt performance. A really interesting addition is a hardware based random number generator. Now, this might not be important for most of you, but when you consider the embedded market, security keys are based on random numbers, which most embedded security devices use. The last thing that the Nehemiah has over the old Ezra is Intel's SSE instruction set. The Ezra relied on AMD's 3DNow! (which really sucked in reality due to no adoption). All in all, the new core should bring better performance and higher clock speeds. The Nehemiah only pumps out 15 watts MAX (10 watts typical), which is WAY lower than even comparable clock speed AMD or Intel CPUs. This allows it to use a small heatsink and a meager fan. 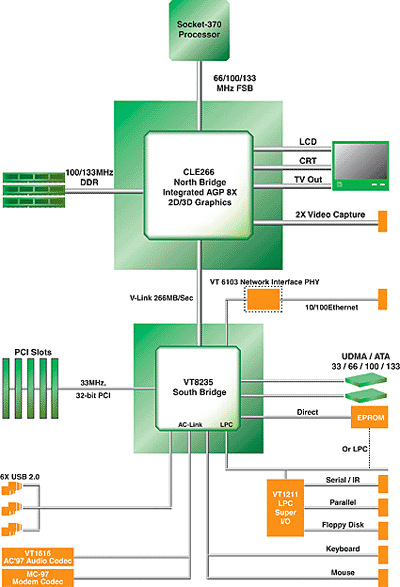 <a href="http://www.via.com.tw/en/viac3/pcb.jsp">VIA has more information</a>. Remember that this is still a normal motherboard, just with a bunch of built on stuff. Built into the northbridge is the graphics system, which is still lacking and still uses the really slow system memory. The frame buffer is 16m,32m, or 64m. You won't really need more than 16m, you won't be playing any real demanding games on this one. It is interesting to note that the transfer speed is at AGP 8x. The southbridge controls everything else. Everything on this board is VIA. Now onto the real review. By the way, this is the first time I really went over some of the technology behind the product! Good for me!